Some have expressed concern that importing biomass for heat from abroad is unsustainable and harmful to the climate. However, there is no evidence to support this, and the use of imported biomass fuels still leads to significant GHG savings and help forest growth. Imported fuel currently makes up 29% of available biomass fuels, but only 4% of total tonnages sold (Analysis by the Wood Heat Association, April 2016). Looking at Greenhouse Gas emissions from imported biomass, they still generate a significant carbon saving compared to the European fossil fuel average. When conducting a full life-cycle analysis of imported biomass, which includes harvesting, processing, storing, transporting and replanting, imported fuels provide GHG savings from 74%-92%. But will transporting biomass for long distances still generate GHG savings? Yes! Not only is this included in the mandatory full life-cycle analysis, but shipping (the main transportation method for biomass) is very carbon-efficient. Although, only three types of fuels are imported from the US (representing 0.06% of available fuels in the UK market), transporting a large shipment of biomass from North America has a similar carbon footprint to transporting a similar load 200 miles by road in the 1,600 lorries that would be required. Any support is predicated on achieving a minimum of 60% carbon savings, and all fuels deliver significantly higher savings compared to fossil fuels. Densification of wood (i.e. compressing wood chip into smaller pellets) reduces the environmental and economic cost of long-distance transport. The volume is smaller, and more wood can therefore be transported without increasing emissions. Pelletising wood is therefore great for imported fuel, where chipped biomass might be equally good for local use. Finally, all suppliers of biomass fuels are required to demonstrate that biomass came from forests with a sustainable forest management plan or sustainable land-use. This includes requirements for protection of soil, water and biodiversity; ensuring harvest levels that do not exceed the long-term production capacity of the forest; and maintain or increase the health and vitality of ecosystems. This is in addition to the strict national environmental regulation in the country of origin. In reality, the net annual increase in EU forest cover is 364,000 hectares, equivalent to around 1,000 football pitches of new forests every day (Eurostat , 2016) . 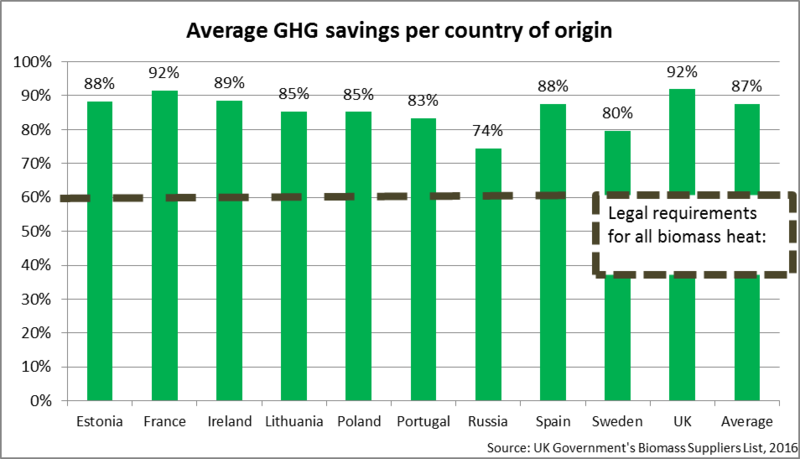 Imported biomass, therefore, both delivers significant GHG savings and supports growth in forest levels, and can therefore proudly call itself sustainable.